1. Hasan ST, Marshall C, Robson WA, Neal DE. Clinical outcome and quality of life following enterocystoplasty for idiopathic detrusor instability and neurogenic bladder dysfunction. Br J Urol 1995; 76:551-557. 2. Mundy AR, Stephenson TP. Clam: ileocystoplasty for the treatment of refractory urge incontinence. Br J Urol 1985; 57:641-664. 3. Rink RC, Adams MC. Augmentation Cystoplasty. In: Operative Urology. Edit. Bruce H. Stewart. Williams and Williams and Wilkins, Baltimore/London. 1982: 98-106. 4. Smith JJ, Swierzewewski SJ. Augmentation cystoplasty. Urol Clin North Am 1997; 24:745-754. 5. Mikulicz J. Zur Operation der angeborenen Blasenspalte. Zentralbl Chir 1899; 26:641. 6. Novick AC. Augmentation cystoplasty. In: Burce H. Stewart, ed. Operative Urology. Williams and Wilkins, Baltimore/London. 1982; 98-106. 7. Garrard CL, Clements RH, Nanney L, Davidson JM, Richards WO. Adhesion formation after laparoscopic surgery. Surg Endosc 1999; 13:10-13. 8. Lapides J, Diokno AC, Silber SJ, Lowe BS. Clean, intermittent self-catheterization in the treatment of urinary tract disease. Trans Am Assoc Genitourin Surg 1971; 63:92-96. 9. Perkash I. Long-term urologic management of the patient with spinal cord injury. Urol Clin North Am 1993; 20:423-434. 10. Pitts WR, Muecke EC. 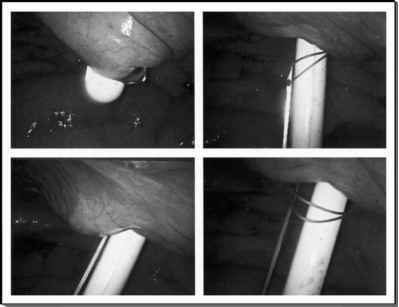 A 20-year experience with ileal conduits: the fate of the kidneys. J Urol 1979; 122:154-157. 11. Schwartz SL, Kennely MJ, McGuire EJ. Incontinent ileovesicostomy urinary diversion in the treatment of lower urinary tract dysfunction. J Urol 1994; 152:99-102. 12. Mutchnik SE, Hinson JL, Nickell KG, Boone TB. Ileovesicostomy as an alternative form of bladder management in tetraplegic patients. Urology 1997; 49:353-357. 13. Leng WW, Faerber G, Del Terzo M, McGuire EJ. Long-term outcome of incontinent ileovesicostomy management of severe lower urinary tract dysfunction. J Urol 1999; 161:1803-1806. 14. Gudziak MR, Tiguert R, Puri K, Gheiler EL, Triest JA. Management of neurogenic bladder dysfunction with incontinent ileovesicostomy. Urology 1999; 54:1008-1011. 15. Milsom JW, Bohm B. Major operative procedures in laparoscopic colorectal surgery. In: Milsom JW, Bohm B, eds. Laparoscopic Colorectal Surgery. New York: Springer-Verlag, 1996: 122-123. 16. Hobart MG, Gill IS, Schweizer D, Bravo EL. Financial analysis of needlescopic versus open adrenalectomy. J Urol 1999; 162:1264-1267.